It was the last of a five day road trip as I found myself camped in the van once again, parked at the Schulman Grove at the end of the paved portion of the White Mountain Road. Laura was in her Honda Element next door, the two of us here to chase a handful of 10,000-foot summits in the White Mountains. To be clear, we were here for that reason because I was the OCD peakbagger, Laura was along for the ride because she loves being in the White Mountains. The expected weather system had moved in during the night, and though it had dropped no precipitation as yet, we were buried in a fog of clouds that were blowing across the range. Our views today would be severely limited, but at least it was dry out, for now. Less than a mile apart, these two summits are located atop the headwaters of Wyman Creek, east of the main crest and a few miles north of Schulman Grove. It was a short drive out on White Mtn Rd, then a short detour down the dirt Wyman Creek Rd to our starting point, about 3/4mi from both summits. We could almost as easily just started from White Mtn Rd (which I would have done with the van) but since we had the extra clearance of Laura's Truck of Fun, we took advantage of it. There is only modest brush encountered for both summits, found in the broad meadow that must first be crossed to reach the base of our summits. A light rain had started even before we got out of the car, prompting us to don our rain jackets. We made our way across the shallow valley, picking our way through the brush with high steps, wondering if the rain was just getting started. It was coming down heavier as we covered about half the distance, and once we reached the first of the bristlecones found on the higher slopes, we sought shelter under them to wait for the rain to let up some. We laughed at each other, hiding under separate trees about 50yds apart, fairly certain by this time that this wasn't our brightest decision. The rain did let up some, so we continued up, but it would remain touch and go the rest of the morning. It took 45min to reach the summit of Peak 10,620ft where we found another Greg Gerlach register, nearly identical to the two we found the other day - loose pages stapled together with Bob Sumner's entry as the only one since Greg's visit earlier in the summer. Surprisingly there were some views, southwest to Silver Peak and north to Blanco Mtn, but no far views with the enveloping clouds. Laura decided to head back to the car while I tackled the second peak, accomplished in about 30min after dropping down to the drainage between them. 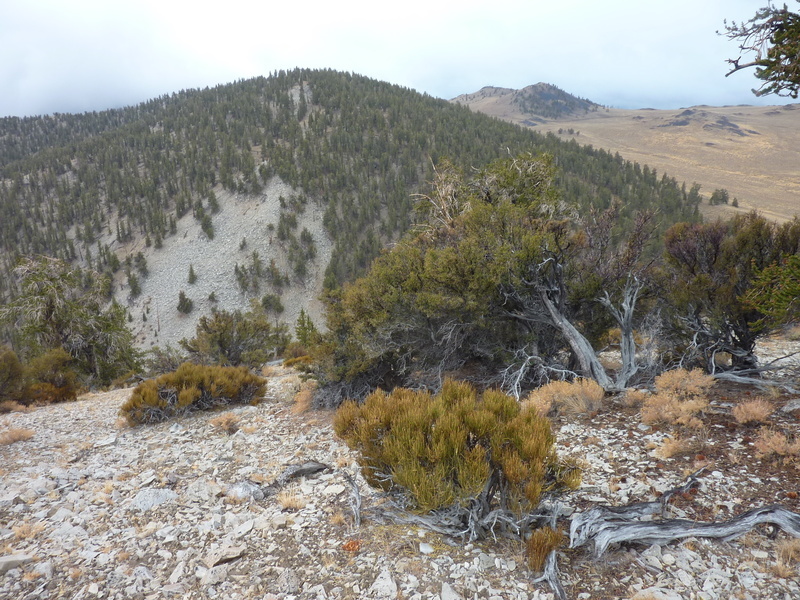 I avoided the brush by staying to edge of the forest, then climbing steeply up to Peak 10,340ft after I had crossed the dry creekbed. I found a fourth Greg register here, a seemingly photocopied version of the others. I turned west and followed the ridge down to the brown meadow below, returning to Laura's vehicle in about 20min. I spied her making her way to the Truck of Fun about 10min ahead of me, so at least she didn't have to wait long. Next up was a visit to Peak 10,940ft, about a mile to the south, halfway back to Schulman Grove. The rain was picking up again, windshield wipers going, our luck seeming to have run out. I was guessing it was another temporary shower, but my optimism was not shared by Laura. When she asked, "Well, what should we do?" I responded with, "Let's go for it! ", after which we got out during a short lull to give it a go. As soon as we opened the door we were hit by heavier rain mixed with slush, a most unpleasant combination. Laura laughed as we both dove back into the car. I had to admit this one might better be left for another time, so back to Schulman Grove we went.